Jack Green was the sole producer of an avantgarde literary newspaper in the early sixties. It was there that “Fire the Bastards!” appeared in three parts. He mounts a well-sourced and thorough counterblast to the book review establishment and its disgraceful treatment of Gaddis’s THE RECOGNITIONS when it first came out, back in the day when $7.50 for a hardback was outrageous. In doing so he also ends up contributing one of the first serious bits of criticism on the novel, as he explores why the unconventional techniques and encyclopedic details are necessary and serve the storytelling. 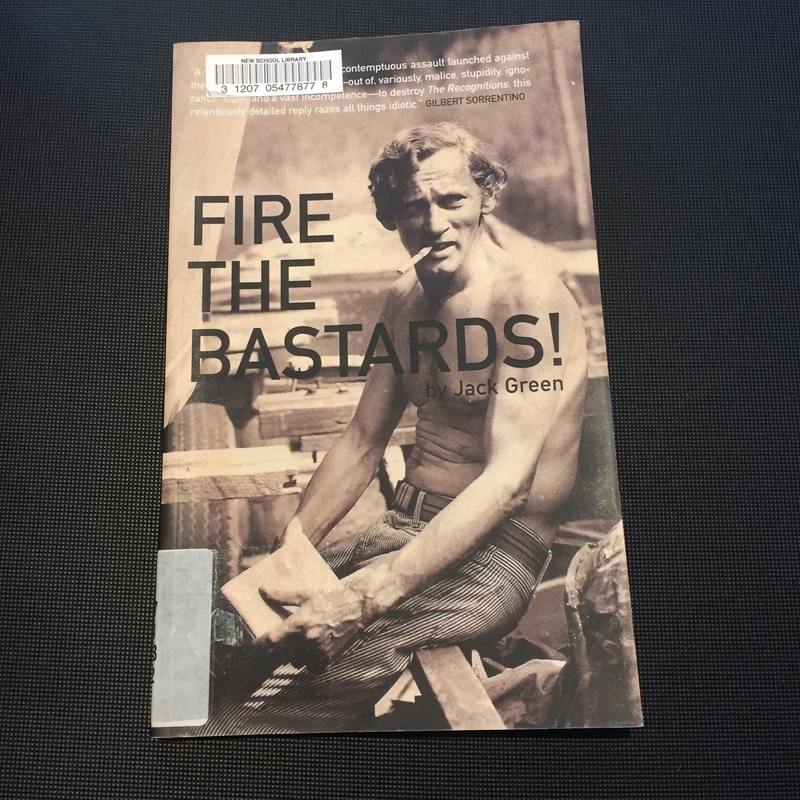 Beyond an incapacity or even refusal to recognize great art when it comes around, Green exposes lazy acts of plagiarism between reviewers and the publisher blurb, embarrassing lapses in reading comprehension, and line after line of well-worn reviewing cliches which melt the mind. Steven Moore has reprinted the entire essay in book form bc in his view nothing has really changed. i admit, this sort of smug philistinism from the crowd that’s supposed to refine our own tastes gets stuck in my gullet too. So this post will also be an excuse to launch my own shitrant (and itll be the first time ive written on film in this blog).